(CNS): Police are still looking for a number of witnesses that were present during a robbery which took place last Thursday that have not yet spoken to detectives investigating the crime. An RCIPS spokesperson explain that there were several witnesses to the incident and although police have managed to speak to a number of them they believe others have not yet come forward. The robbery happened on 31 May at the Eastern Avenue Texaco when a lone masked man entered the store armed with what appeared to be a gun and stole money from the cashier. The suspect escaped on foot in the direction of the Swamp. Detectives said that not all the witnesses have yet been identified and they are now appealing to anyone who was in the store when the robbery occurred or who may have witnessed anything suspicious and has not yet spoken to police to come forward. 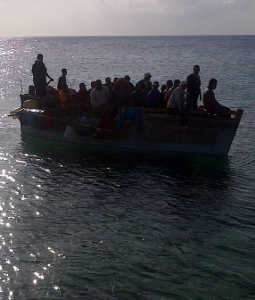 (CNS): Government officials announced Friday that the repatriation of 28 Cuban refugees on Thursday evening was carried out without incident. All of the Cubans that were returned to the neighbouring island at around 6pm last night had arrived in the Cayman Islands on 18 April on one boat which had run into difficulties in Cayman Brac. The group consisted of 27 men and one woman and included the four men who had escaped from the George Town detention centre where all of the refugees were being held by the Cayman authorities. Two of the men who had escaped were recaptured by law enforcement and two other had returned to the centre voluntarily within 48 hours of their escape. Government officials said that the police assisted by Immigration Officers, had acted as escorts during the repatriation. 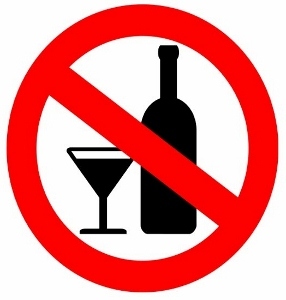 (CNS): Despite 18 July being designated a public holiday to facilitate the national referendum on one man, one vote and single member constituencies, no booze will be sold until an hour after the polls close in the evening. The Elections Office has confirmed that, in line with the election law governing an election, the referendum day will also be dry. All proprietors of premises that hold licenses issued under the Liquor Licensing law are being warned that no intoxicating liquor can be sold, offered for sale or given away between the opening of the polls, which is at 7:00am and one hour after the close of the polls at 6:0ppm, which means a booze ban until 7pm across all three islands. “It should be noted that whoever contravenes this section of the Elections Law (2009 Revision) (section 91) is guilty of an offence and liable on summary conviction to a fine of five hundred dollars or to imprisonment for six months," officials from the elections office warned. Meanwhile, applications for absentee voting including postal or mobile voting will be accepted by the Elections Office until 6 July, after which applications cannot be accepted. or click on the attachment below the article. They can also be collected from a registering officer or from the Elections Office in Smith Road. People who are unable or unlikely to go in person to the polling station because they are in a hospital, rest home or other similar institution, or a geriatric at home, as well as those who are blind, physical incapacitated or unable to vote becauseof their occupation can apply for a mobile vote. West Bay: 12 July at the John A. Cumber School Hall for electors that are unable to go to the polls because of employment/service or occupation between 9:00am until 1:00pm. In the case of private residences/hospitals/rest homes or other similar institutions a mobile team will visit between the hours of 9:00am and 6:00pm. George Town: 11 July at the Elections Office at 150 Smith Road for electors that are unable to go to the polls because of employment/service or occupation commencing at 9:00am until 1:00pm. Bodden Town: 10 July at the James Manoah Bodden Civic Centre for electors that are unable to go to the polls because of employment/service or occupation commencing at 9:00am until 1:00pm. North Side: 9 July at the North Side Primary School for electors that are unable to go to the polls because of employment/service or occupation commencing at 9:00am until 1:00pm. In the case of private residences/hospitals/rest homes or other similar institutions a mobile team will visit between the hours of 1:00pm and 6:00pm. East End: 9 July at the William Allen McLaughlin Civic Centre for electors that are unable to go to the polls because of employment/service or occupation commencing at 9:00am until 1:00pm. Little Cayman: 6 July at the Public Works workers accommodation building for electors that are unable to go to the polls because of employment/service or occupation commencing at 9:00am until 1:00pm. Cayman Brac: 9 July at the Aston Rutty Centre for electors that are unable to go to the polls because of employment/service or occupation commencing at 9:00am until 1:00pm. (CNS): The premier’s office has said it has no problem doing business with China Harbour Engineering Company (CHEC) and will be continuing negotiations regarding cruise berthing facilities in George Town. The statement comes in the wake of revelations that the firm was sanctioned by the World Bank because of issues relating to corruption. The premier said he does not believe CHEC has any connection to the circumstances that led to the sanctions and no reason to discontinue the dealings with the Beijing firm. The statement came in the wake of other regional news reports that a former port chairman in China was sentenced to death for taking bribes from CHEC and its parent company, CCCC.. Mounting media coverage here in the Cayman Islands and other countries in the Caribbean where CHEC is doing business, not least in Jamaica, is causing growing concerns about the Chinese firm as a suitable business partner for public sector developments. The Cayman Islands governor has also made it plain that the UK will not sanction the proposed port deal with CHEC at present, not because it objects particularly to the firm itself but because of the failure of the premier to follow international best procurement practice when selecting the company. Nevertheless, speaking through his office Friday afternoon, McKeeva Bush made it clear that he was pressing on with the port talks with CHEC, despite public opinion and the UK’s position. “It is evident that CHEC is far removed from any wrongdoing that resulted in the original sanctions placed on CRBC by the World Bank,” the statement read. “The far reaching effect of the World Bank debarment of CRBC only relates to CHEC because it is a subsidiary of China Communications Construction Company, which inherited the debarment from its predecessor. Neither CHEC nor its parent company CCCC has been sanctioned by the World Bank for fraud or any other misconduct actually committed by those companies. The premier’s office pointed to the “many years of discussing and negotiating” over the port project and reiterated that the government still believes that CHEC offers the best value for money to the Cayman Islands. The latest scandal relating to CHEC arose earlier this week after the Jamaican Contractor-General raised his concerns about that country doing business with CHEC while it remained under a World Bank ban. The ban on any projects involving World Bank funding was imposed on China Communications Construction Company and all its subsidiaries, including CHEC, because CCCC was the designated successor to China Road and Bridge Corporation (CRBC), which was accused of corruption. Under the bank's rules successors on projects where wrongdoing has been found continue to carry the can and are therefore subject to the same sanctions. The World Bank states: “This action is based on recent changes in the World Bank sanctions system to clarify that successor organizations – through purchase or reorganization – will be subject to the same sanctions applied to the original firm.” As CCCC is the designated successor entity to China Road and Bridge Corporation (CRBC) the bank confirmed the ban remains in place. In a release this week from its regional office, Zhongdong Tang, Regional Director for CHEC in Latin America, said the firm was not involved in and has never been involved in any activity that has attracted any sanctions by the World Bank. “CHEC itself has never been under any investigation by the World Bank,” it said. The accusations of fraud were made against CRBC, which maintained that there was no factual or legal merit to the allegations. Tang said CCCC initiated discussions with the World Bank to arrive at a resolution of the issue. “At the time of the debarment in January 2009, the sanction was imposed on CRBC and not on CCCC or any other subsidiary of the company,” he added but acknowledged that the sanctions came about in July 2011, based on banks new position that successor organisations would be subject to the same sanctions to the original firms. According to other media reports, the former Chairman of China’s Hebei Port Group, Huang Jianhua, was sentenced to death earlier this year for taking bribes from CHEC and CCCC. Chinese authorities say Huang was given a house worth more than US$628,000 after he arranged for them to win a bid in 2008 for the construction project at the Huanghua Port Wharf in China. Executives of CHEC and other sister companies allegedly also gave Huang US$10,000 in three payments. Investigators were said to have found "a trail of corruption by CCCC” and at least two of its subsidiaries, including CHEC. Meanwhile, in another international case relating to the Chinese firm, Arafat ‘Koko’ Rahman, a son of the former Prime Minister of Bangladesh, Khaleda Zia, was jailed last year for laundering millions of dollars in bribes taken from CHEC. See full statements from the premier’s office and from CHEC below. (CNS): The anticipated verdict in the crown’s case against 18-year-old Chakane Jamelle"CJ" Scott, for the murder of 21-year-old Asher McGaw (left) in East End last year has been postponed until next week. Justice Alex Henderson revealed Friday morning that he required a little more time to examine the evidence in the case before settling on his verdict as he postponed the planned 2:00pm hearing to Tuesday. The case, which was heard alone by the judge, depends heavily on the eye witness testimony of a 17-year-old man who says he was there when Scott begun shooting at his best friend, McGaw, in the early hours of the morning of 22 September. The body of the young East End man was discovered by police on routine patrol lying in the road in John McLean Drive. 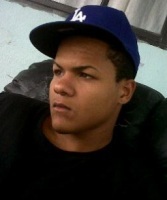 He had been shot three times to the head and body. On the night of the shooting Antascio Rankine said that the three men, who were all friends since childhood, had gone to the car park of the East End clinic in order to fire off a flare gun and at some point Scott turned on McGaw with a real weapon. Rankine said he fled from the scene to his own home and because he was so confused failed to summon the emergency services. Although Scott failed to give evidence or answer police questions regarding the accusations against him, via his attorney he denied being present at the shooting or knowing anything about the killing. The verdict will now be delivered at noon on Tuesday. 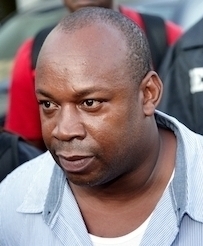 (CNS): According to press reports from New York, Jamaican drug lord Christopher ‘Dudus’ Coke (43) has received a 23 year prison sentence following his guilty plea to charges racketeering and conspiracy. The sentence handed down Friday morning was not unexpected despite the Coke’s pleas for leniency and his plea to the lesser charges. District judge Robert Patterson handed down the maximum prison term following a hearing last month where several witnesses gave damaging testimony. Before Coke was eventually extradited to the US to face charges more than 70 people were killed during a violent stand-off in his home base of Tivoli Gardens, Kingston. Coke's fall from the undisputed don of the Jamaican underworld to a US felon started in September 2009, with an extradition request from the United States which led to a protracted dispute between the governments of Jamaica and the US. The dispute lasted for almost a year and ended with then Prime Minister Bruce Golding acceding to the US request and sending both the Jamaica Defence Force and the Jamaica Constabulary Force into Tivoli Gardens to arrest him. Coke was not captured in the offensive, but he was held about a month later, allegedly disguised with a woman's wig, in the company of clergyman Al Miller. The ongoing farce of McKeeva Bush’s continued leadership in the face of three separate police investigations is now reaching the point of ridicule. In any other democratic country a leader facing such intense police scrutiny would have stepped aside months ago in order to allow investigations to be carried out swiftly and successfully and in order to prevent further damage to the reputation of the government and of the country itself. But Bush’s petulant refusal to let go of his power even temporarily not only risks making Cayman a laughing stock, it also makes it very difficult to take his own political position seriously. Who could seriously acknowledge Bush’s calls for fiscal prudence at the Caribbean Development Bank meeting, for example, in light of the knowledge that his own financial irregularities are under intense police scrutiny? Who will listen to a leader who urges others to exercise financial caution when the Stan Thomas letter, revealing his demand for a $350,000 payment which still remains to be properly explained, is in public circulation? Even if Bush’s claims that the payment was for ‘consulting fees’ are true, the proximity of his wife’s company’s involvement in the West Bay land deal seems too close for comfort for those who hope to see complete professionalism and impartiality from a political leader. And when one reaches the point at which the highest elected official of the Cayman Islands goes publicly on record with a damaging, babbling and paranoid statement of aggression against the representative of the British government in Cayman, any voter must start to ask whether the price of keeping Mac in office isn’t becoming too high for that office to bear. How great is the value of Bush’s questioned, debated and investigated leadership compared to the cost of irrevocably damaging the relationship between the premier’s office and the governor? Are we really so desperate to keep a man in office who we KNOW requested the release of an illegal shipment of dynamite despite a complete lack of proper licensing that we are prepared to watch him reduce the office of premier to little more than a public joke? Bush’s insistence on remaining in office must inevitably damage the position of premier, as it has required him to make several weak attempts to swipe at the accusations against him, each one only resulting in making him look more desperate, as he tries to twist language and motive to conceal the truth rather than clarify matters. While Bush was quick to try to dismiss allegations surrounding the Stan Thomas letter by blaming his assistant, Richard Parchment for making a simple ‘mistake’, the sentence “I have ensured that all of the proposed re-zoning issues have been agreed and approved by Cabinet” is pretty hard to explain away as a misunderstanding. Is this the level of influence and involvement we want an elected minister to be having in local business transactions? And can it possibly be ethical for him to be involved in this way when he also sat on the Cabinet which made the decisions about zoning to enable such schemes to go through, whether or not he claims to have acted impartially in this instance? The deeper one looks at Bush’s administration and activities, and the more closely one investigates his attempts to deflect the allegations against him, the more doubtful it seems that he is the best person to lead Cayman forward in a fair, accountable and impartial manner. What kind of political acumen and wisdom can we expect from a man who lashed out in an undignified and apoplectic fit to hurl utterly groundless accusations and conspiracy theories at the UK’s highest representative in the Cayman Islands? Even the very statement itself was highly embarrassing, with a confused and enraged Bush seeming to utterly contradict himself by both accusing Governor Taylor of having “done nothing for three years” and “doing nothing of substance” and yet simultaneously suggesting that he was “stealthily and insidiously” working against the success of Cayman. The very idea is farcical, but what should concern voters far more is the arrogant selfishness with which Bush is prepared to throw around such damaging and unfounded accusations in order to defend his own precarious position, with utter disregard for the damage it could do to the office of premier and the relationship between the Cayman Islands and the UK. In almost any other democratic country in the world Bush would by now have been forced to step aside before he drags the position of premier into the dust. No, there is no legislative requirement for him to do so as a result of his being the subject of police investigations, but this is probably not a constitutional decision so much as an assumption that a person in such high public position would naturally have the decency and respect for his office to do so voluntarily! But neither have Bush’s political allies and funders shown the backbone required to force him to step out of the limelight – and this is where Caymanians are not only allowing Bush to fail them, but also failing themselves. 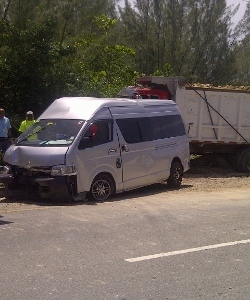 (CNS): A major collision on the West Bay Road between a mini bus and a dump truck loaded with fill caused traffic diversions this morning(Friday 8 June) as police closed the road. The crash occurred just outside Calico Jacks at around 10:15am when the two vehicles, which both appeared to be heading north, collided. A police spokesperson said no one was seriously injured in the crash but enquiries into how the collision happened are now ongoing. It is not known if the bus was carrying passengers at the time of the smash. Police re-opened the West Bay Road just before noon. (CNS): The deputy premier’s ministry is building a $250,000 command centre on Little Cayman to use in the event of a hurricane or other disaster. The 1,254 square-foot addition to a government building on Spot Bay Road, which is used to house public works staff and doubles as an emergency shelter, “will provide officials with adequate privacy and ample storage for shelter supplies, an office for the command leaders, and a central command room for interactive decision making,” a release from the ministry said. The windows, doors, walls and roof of the new facility will be hurricane safety-rated and the building floor will be constructed 22 feet above sea level, one of the highest points on the western side of the island. A back-up generator will provide electrical supply if there is a power outage, according to the Ministry of District Administration, Works, Lands and Agriculture (DAWL&A). Work is expected to start in June and will take around four months to complete, the ministry said following the groundbreaking for the extension on Wednesday, 29 May. The expansion project contract was awarded to James Thomas of Maximum Construction and Repair Company, which submitted the winning bid of $250,550. The original estimate for the project by the ministry was below $250,000 – the threshold for tenders to go through the Central Tenders Committee – and the tendering was done through the ministry. However, when it appeared the bids were all above this figure, the CTC then stepped in to oversee the tendering process, the CTC said. “The Cayman Islands Governments takes hurricane preparedness and the protection of its citizens and residents very serious,” said Deputy Premier Juliana O’Connor-Connolly, who is the minister responsible for District Administration. “Little Cayman residents called for the expansion because the current facility is not big enough to accommodate a proper command centre in the event of a national emergency. I am sure that having a purpose-built command room will be a huge resource in the event of a natural disaster." The current Little Cayman Command Centre is a multi-purpose building that was initially set up to house Public Works workers that come over to the island to work on various projects for short periods of time. There does not appear to be any additional function intended for the command centre now under construction.